Tom had so many passions: music, reading, sound and recording technology, good food, good company. I don't know many people who have been able to follow their passions as faithfully as Tom. He was quick to laugh, slow to anger and possessed a wonderful sense of humor and humility. He was comfortable to be around. He was a friend. With all these attributes, and more, I think my favorite thing about Tom was his generosity: generosity of talent, time, energy, knowledge and spirit. He liked to make music and have fun doing it. That spirit was palatable and infectious. It will always infuse some of my happiest memories. If nature truly abhors a vacuum, she will have her hands full dealing with the loss of a most powerful presence. So will we all. Tom Rowe was one of the good guys. He was a gentleman under all conditions, bouyant when others would sink, optimistic in the face of adversity. His first love was his family: his wife Donna and his five wonderful children. Tom was a loving son to his parents and brother to his three siblings. He possessed a natural wit... tempered by a down-to-earth perspective..... always delivered with grace and intelligence. He was a natural musican of prodigious talent and curiosity. Tom possessed an inexhaustible desire to make music of every kind and genre...at any time...in any place....for anyone. He was a man happy with his work and with his life. Tom embodied the true meaning of the term "working-artist." He was a success in every sense of the word. Tom was a friend, indeed; and he will be terribly missed. However, and most of all...... he IS and WILL BE a presence with us in our hearts, on stage, and in the gift of his many songs that we will hum throughout our days..... for the rest of our days. PORTLAND, ME--Thomas J. Rowe, 53, of Auburn, died early Saturday morning, January 17, 2004, at Maine Medical Center, following a courageous battle with cancer. He was born in Lewiston, November 4, 1950, to Charles “Bud” and Thoma Rowe. He was educated in the Auburn school system and graduated from Edward Little High School, class of 1969. As a professional musician and entertainer, Tom was dedicated to bringing music and joy to people across the United States and Canada. After receiving a clarinet at the age of six, he set out on a lifelong path of performing which brought him from the grange halls of rural Maine to major concert halls across the country, including Lincoln Center, Town Hall, and Wolf Trap. After receiving the gift of a banjo at age thirteen, Tom formed a high school folk group with some friends. As Chord Majority, they toured extensively throughout Maine, appearing frequently on local TV and radio shows. He also performed with local dance bands, playing saxophone alongside his dad. 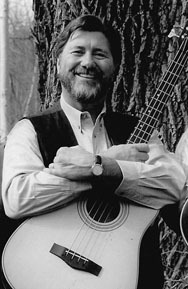 Tom attended the University of Southern Maine as a Music Education major from 1969-1974, during which he helped form the band Vehicle. Two years later, he joined a popular Lewiston-based dance band, The Flairs, which was later reconfigured as Voyage. From 1974-1982, Tom held several positions in public education, including one year as music director in his former high school. In 1975, Tom was invited to join the popular Maine folk/rock group Devonsquare, in which he met brothers Chuck and Steve Romanoff. In the fall of 1975, the three left Devonsquare to form the folk trio, Schooner Fare, with which Tom sang, played bass guitar, and tin whistle, writing many well-known songs. He left teaching in 1982 to devote himself fully to his family and his performing career. In 1992, Tom began touring and recording with his son Dave as the duo, Rowe by Rowe. In 1998, Rowe by Rowe added a third member, Denny Breau, and the group was renamed Turkey Hollow. Tom was a member and choir director for the First Universalist Church, Unitarian-Universalist, in Auburn, and was also a bass clarinetist with the Auburn Community Band. Tom leaves behind an incredible legacy of music, much of which was recorded in his own home recording studio in Auburn: thirteen CD titles with Schooner Fare, a 1991 solo title, the 1997 Rowe by Rowe title, and two titles with Turkey Hollow. He is survived by his parents, Thoma and Bud Rowe of Oxford; his wife, Donna Rowe of Auburn; brothers Chuck Rowe and Russ Rowe, both of South Paris; his sister, Shirley Rowe Dargie of Oxford; five nephews and a niece; his son, David Rowe of Raymond; daughters Erikka Rowe of Portland, Marin Rowe of Lewiston, Summer Rowe of Auburn, Toni Lyn Rowe of Auburn; and two grandchildren of Raymond. A memorial service was held on Sunday, February 8, 2004, at the Bates College Chapel, Lewiston. Memorial donations may be made to the Jack McPhillips Memorial Fund, PO Box 2753, South Portland, ME 04106, the Maine Cancer Foundation, PO Box 553, Portland, Maine 04112, or the First Universalist Church Organ Fund, 169 Pleasant St., Auburn, Maine 04210.